Because i beleive in good friendship. I am straightforward and soft spoken beleive on friendly and honest relationships. One should judege others sincerity and than decide. This is my firm beleive thats why i wanto people should know me. 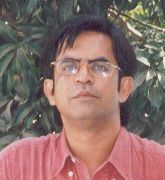 I am Faiz Siddiqui, male age about 37 working private job. I live bachlor and single. I beleive a good relationship based on sincerity and soberty. faizsiddiqui hasn't asked any friends to write a recommendation yet. faizsiddiqui has not yet answered any of the optional questions that would tell you more about him.